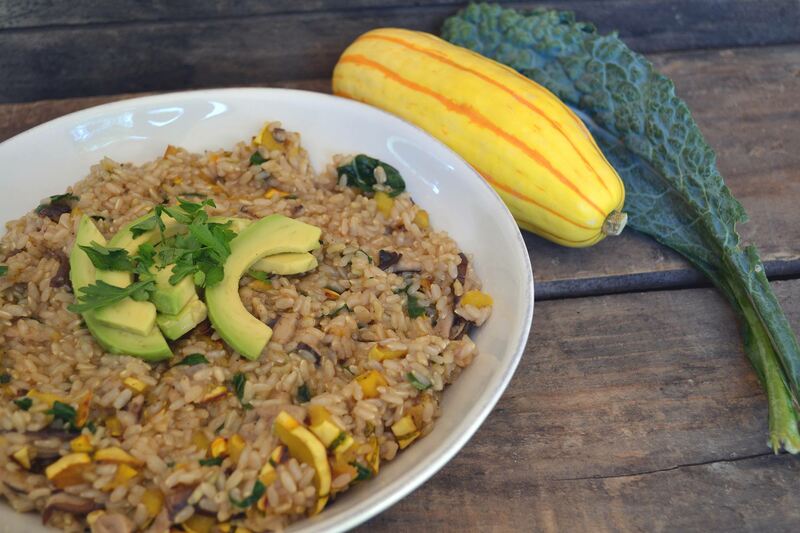 We love the fall flavors in this rice pilaf. Filling and full of veggies, this rice pilaf makes a nice side dish and packs well for a lunch. Preheat the oven to 425 degrees Fahrenheit. Place the sliced delicata in a pan and drizzle with 1/2 tablespoon olive oil. Season with the cumin, chili powder and salt and pepper. Roast for 25 minutes, stirring twice. Meanwhile, heat a saucepan over medium heat with one tablespoon olive oil. Saute the mushrooms for 5 minutes, or until softened. Add in the onion and let cook for one minute. Stir in the brown rice and let the oil coat the rice. Pour in the broth and bring to a boil. Cover and reduce heat to low and let simmer for approximately 25 minutes, or until the broth is absorbed. Stir in the roasted squash, kale and sage leaves. Season with salt and pepper.